ballpark. The Red Sox have been doing this thing where they pull the starting pitchers and relievers in after the first group of hitters finish their batting practice. Everything in that time phrase was either hit to left field or right field. Normally the coaches do not throw baseballs into the stands so getting a ball would have to come from the bat of one of the players. The second group came up and Mike Napoli was in the cage. I had my phone on video and in the video you can hear the fans react to the ball being caught. I turned off the camera and before I knew it another ball was coming into the stands. I ran over and caught that one as well for my 2nd of the day. When Hanley came up in the cage the first one was coming at us to our right. It was high and I knew it was going to bounce off of the wall behind us. I turned around and watched it bounced off the wall. I didn’t have to move as the ball bounced off the wall and then right into my glove. Hanley wasn’t done with his show of power during batting practice. He hit another shot to centerfield. This time it was in the first row seats. I reached up and grabbed it. I was on my way to give a kid a ball when the ball was hit. I then gave the kid one of the balls I caught. Turns out it was the first ball that I caught. 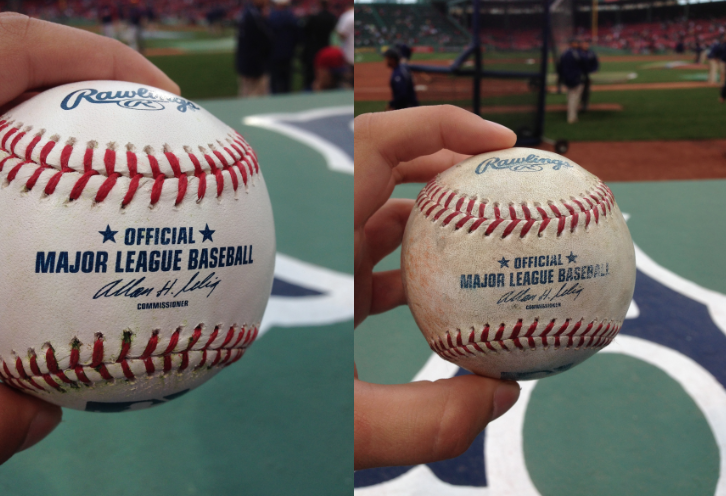 The second ball I got from Hanley had two star marks. One on the sweet spot and one near the Official MLB scripting. The ball was 4th of the day. Miami Marlins came out to do batting practice. Frank Menechino was giving Jordany Valdespin fielding off the monster and centerfield wall. A few were coming close to the wall so I moved into a good position to see if he would hit one over the wall by accident. He hit one that looked like it was going to clear the wall, I moved to my left to make sure it was going over the wall. As it came in I reached up and caught it for my 5th of the day. I was slightly nervous. I didn’t want to throw the ball away. That would have been awful. It was also weird throwing down from the centerfield wall. I got comfortable throwing by the end of it. The last 30s of the video is the best because I had gotten used to throwing by then. Mat Latos also came over and was talking to Dyson and I am still wondering what they were saying to each other. It was a great experience. At this point it was my sixth ball of the day. It was near the end of batting practice so when we were done tossing the ball around I went over to the #GiftOfTheSox machine. I won a phone cardholder and then I went to the dugout where I usually go. 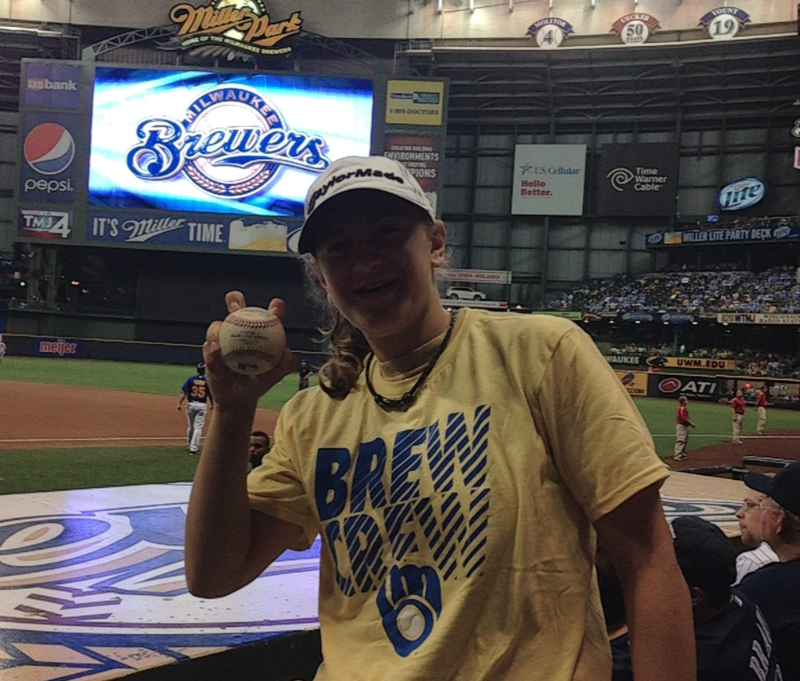 After batting practice, a batboy had a ball in his hand and I asked him nicely for the ball. He then tossed me the ball for my 7th of the day. The ball looked like it was rolled in mud. After batting practice Jose Fernandez was signing autographs after he went and talked to fans near home plate. Mo’ne Davis who was an American Little League Baseball pitcher from Philadelphia, Pennsylvania threw out the first pitch while her teammates watched around her. She was the first girl African-American girl to play in the Little League World Series and the first to earn a win and to pitch a shutout in Little League World Series history. She is also the first Little League baseball player to appear on the cover of Sports Illustrated as a Little League player. Even after almost a year since she played in the Little League World Series, Davis is still having an impact in baseball. 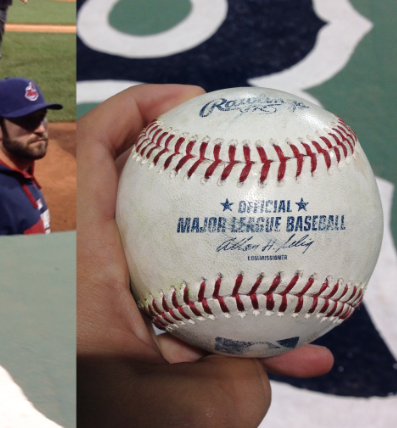 After the first pitch, Dustin Pedroia greeted her with the baseball. Before the game started Sam Dyson came over to me asking if I was looking for anyone. I had told him that the ball we played catch with was in my bag and if he could sign after the game. I told him I would be at the end of the dugout and to look for me. I then told him some of the players I was looking for and he tried to see if some of them would come over but no one did. The game was going to start soon so many player were already in game mode. During the game, Wade Miley was starting for the Red Sox and Dan Haren was starting for the Marlins. In the bottom of the second inning, Shane Victorino and Travis Shaw singled. With Victorino at third and Shaw at first, Ryan Hanigan singled, which allowed Victorino to score the first run of the ball game. Mookie Betts came up to bat and grounded into the inning ending double play. Michael Morse who was playing first base came over to the dugout with the ball and then tossed it to me, for my 8th ball of the day. In the top of the 3rd inning, the Marlins got a run of their own when Christian Yelich hit a single to center that allowed Cole Gillespie to score from second. Yelich advanced to third on the wild throw but was stranded on 3rd when Adeiny Hechavarria struck out to end the inning. The lead didn’t last long because the Red Sox would respond in the bottom of the 7th inning. Steven Cishek replaced Dan Haren on the mound. Cishek allowed a hit and walked another batter and Miguel Rojas had an error that gave the Red Sox the bases loaded for Brock Holt. Mike Dunn relieved Cishek and struck out Holt. Dunn then was relieved by Carter Capps who gave up a single to Xander Bogaerts, which allowed everyone to come home giving the Sox a 4-3 lead. The Sox never lost the lead as Koji Uehara pitched the 9th inning and got the save. At the end of the game Umpire Mike Everitt was handing out baseballs and I got one for my 9th baseball of the day. Sam Dyson also came from the bullpen and saw me and came over to me. I gave him the ball and pen and he signed it. I also wished him luck for the rest of the season. Having no classes on Wednesdays came in handy on a day game during the week. I was planning on going to this game for a while. When I was buying my tickets, I originally thought it was a night game and when I found out that it was a day game I was concerned that it would interfere with my classes at school. So, I didn’t buy the ticket and bought a ticket for the night game the day before. I wanted to go to a Nationals game to see if I could get Bryce Harper’s autograph. When I picked my classes and got everything figured out with school, I didn’t have class on Wednesday. The first thing I did was buy a ticket to this game. 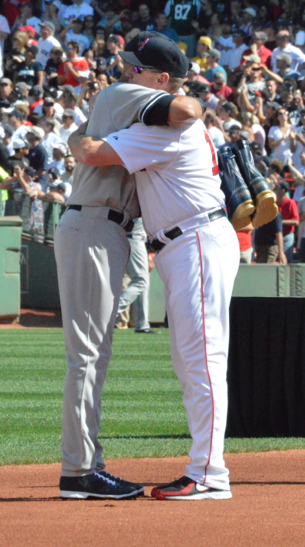 Not only was the game vs. the Nationals but it was also a special day throughout MLB. It was Jackie Robinson’s day. Jackie Robinson Day has been in the MLB since 2004, honoring the day Robinson made his major league debut in 1947. On April 15th every year, each player, coach, manager, and umpires wear the #42 honoring Robinson’s accomplishments. Also, this game was important to the city of Boston. It was also the two-year anniversary of the Boston Marathon Bombings. The game was very special and it was one of those games you wouldn’t want to miss. For the game I wore my Boston Strong shirt. After going to the game the night before, I stayed home and left my house around 9:00 am to drive into Boston. 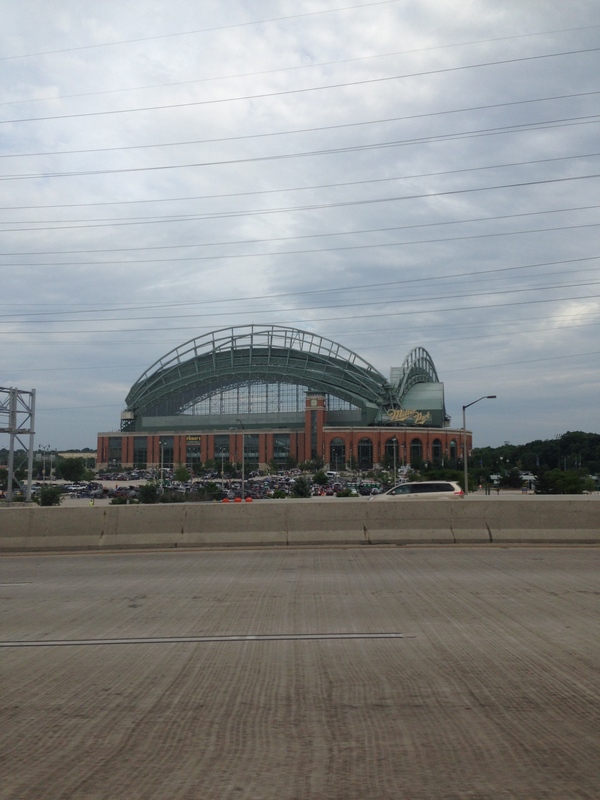 I hit some traffic going in and got to the ballpark around 10:00 am. I walked over to Gate C and there were tons of people walking in so I got in line. I didn’t know at the time but I wasn’t supposed to go into the ballpark. When I got into the ballpark I walked up to outfield seats to see if there was batting practice. On a day game, there isn’t batting practice but I wanted to check just in case. There was no batting practice but there were tons of people in the grandstands. Apparently, the kids were on a field trip from school. Dave Mellor, the head groundskeeper, was talking to the kids about the field and answers any questions they had. The kids were learning about the weather and were learning about how the field works. As Mellor was talking to the kids some Red Sox players were coming out to warm up. Clay Buchholz and Porcello were warming up in the outfield with Pitching Coach Juan Nieves. After Buchholz and Porcello were done playing catch, they walked over to the Red Sox bullpen. I went over to the bullpen to go watch them. 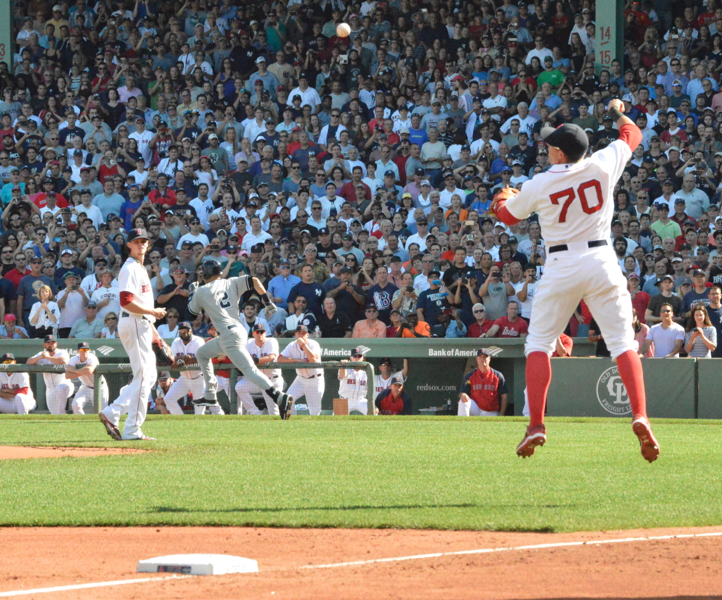 Buchholz went up first. He pitched as Nieves watched. 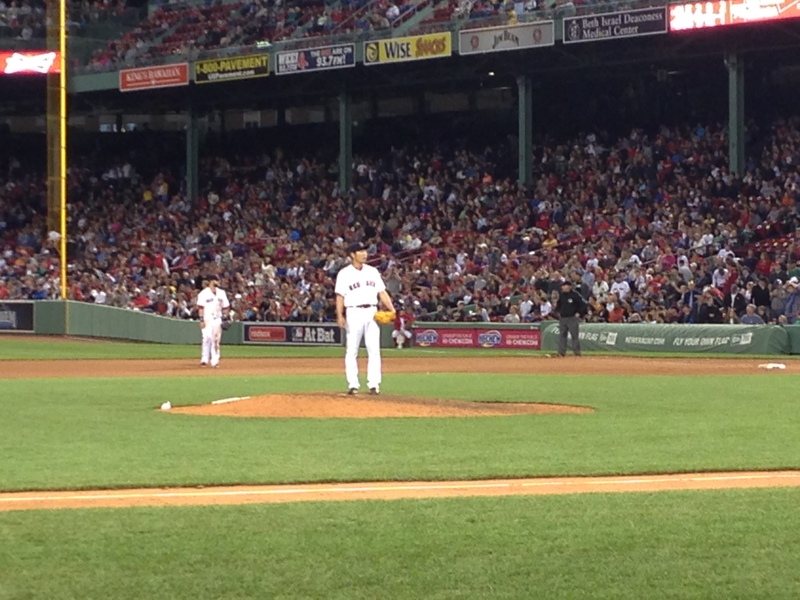 Buchholz threw a pitch in the dirt and gave it to Nieves. He then looked at it and then looked at me and showed me the ball to get my attention. He then tossed me the baseball. Porcello had come over near me during Buchholz’s session. I congratulated him on his new contract signing. He was very nice and thanked me. I also asked him if after he would sign. He said he would after he threw. After Buchholz was done with his bullpen session, Porcello started his session. 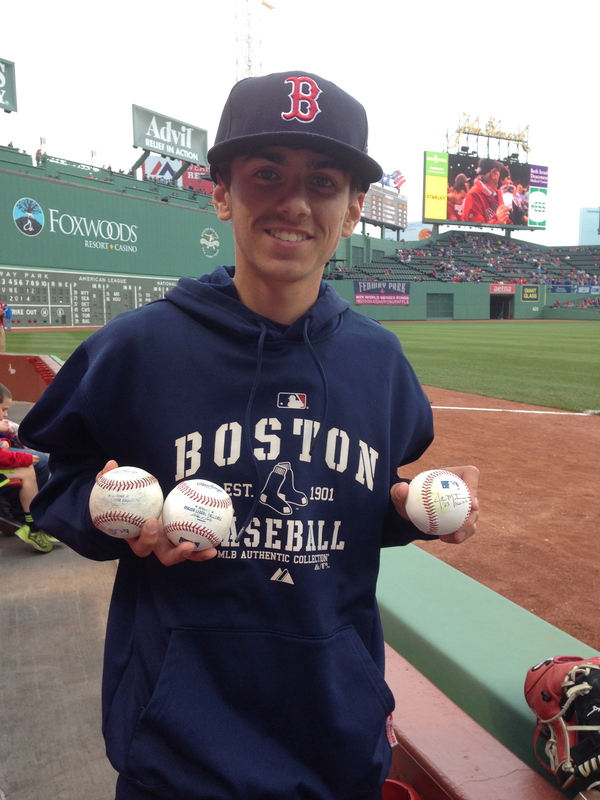 During Porcello’s bullpen session he didn’t like 3 of the baseballs. Nieves threw me two not even 5 seconds apart from each other. Then he also threw me one later on in the bullpen session. When he was done he went into the bullpen and sat down with Buchholz and Nieves. The gates for Red Sox nation opened around 11:05AM after I was already in the ballpark for an hour. Mike Davison had entered the ballpark and went over to the bullpen where I was. He took out his ball retriever and grabbed two baseballs in the bullpen. 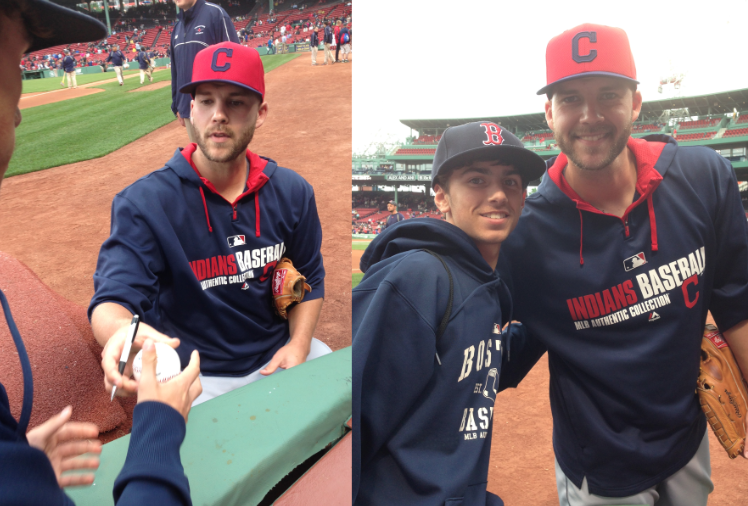 As Buchholz and Porcello got up to leave the dugout Porcello came over and signed. He signed for a lot of people who were over near the dugout. 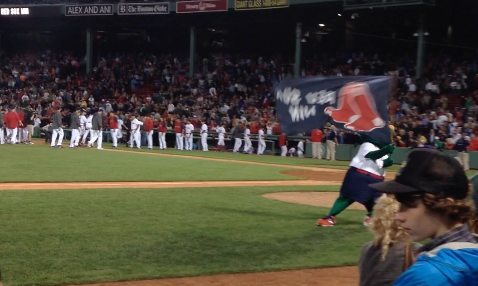 After they left the rest of the Red Sox pitchers were tossing over near Pesky’s Pole. When the security guards allowed the fans to get to the rest of the ballpark, I went straight to Pesky’s Pole. 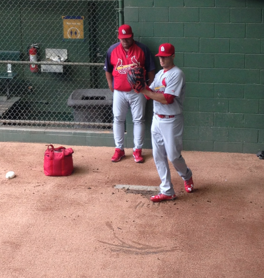 I saw Joe Kelly and Justin Masterson playing catch. When I got near them they were just finishing up. I called out to Kelly. He then tossed me the ball he had for my 5th of the day. I asked if he was going to sign autographs today. He said he could sign before he worked out and walked over to me. As he was signing I asked him since he was a fan of selfies if we could take one. He said we could and we took one. After the selfie, I started walking to the Nationals dugout. I saw Brock Holt taking grounders near third and I stopped walking towards the Nationals dugout and turned around and headed back to the Sox’s dugout. I waited at the dugout as Holt came in. He started heading right next to the dugout with a bunch of kids around. I went over and got in line. Holt then signed a baseball I gave him. After I left the area, Holt continued signing autographs. 15 minutes later Washington National’s players were coming out and warming up. Bryce Harper of the Nationals came over and signed. For me this was great because the day before I was so close to getting his autograph. My thought process was I couldn’t get turned down again. As soon as he grabbed my pen, I was so relieved. He signed the ball I gave him and he continued down the line. 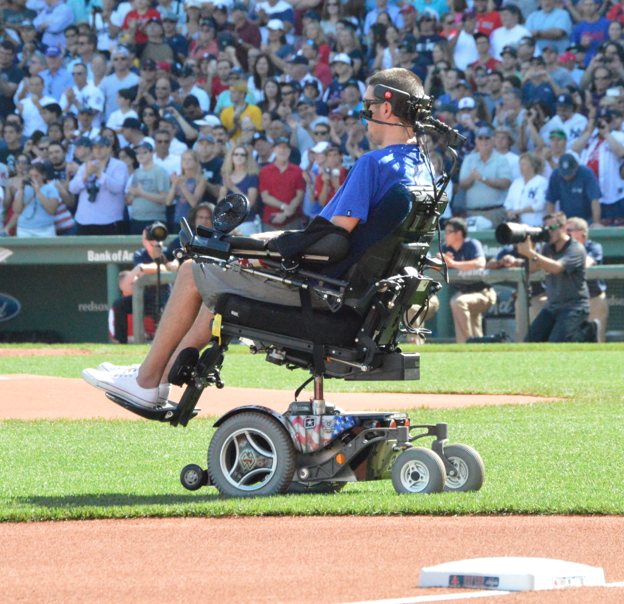 Jeff Bauman, who lost both of his legs during the bombing, and Patrick Downes, who lost his left leg during the bombing, threw the first pitches. Then the survivors and first responders yelled “Play Ball.” Ryan Zimmerman was tossing with Ian Desmond and Bryce Harper was throwing with Danny Espinosa. After they were done Ryan Zimmerman tossed me up a ball for my 6th of the day. Carlos Arredondo and his wife carried a Boston Strong Flag off the field and Washington National’s players talked to Jeff Bauman as he walked by. 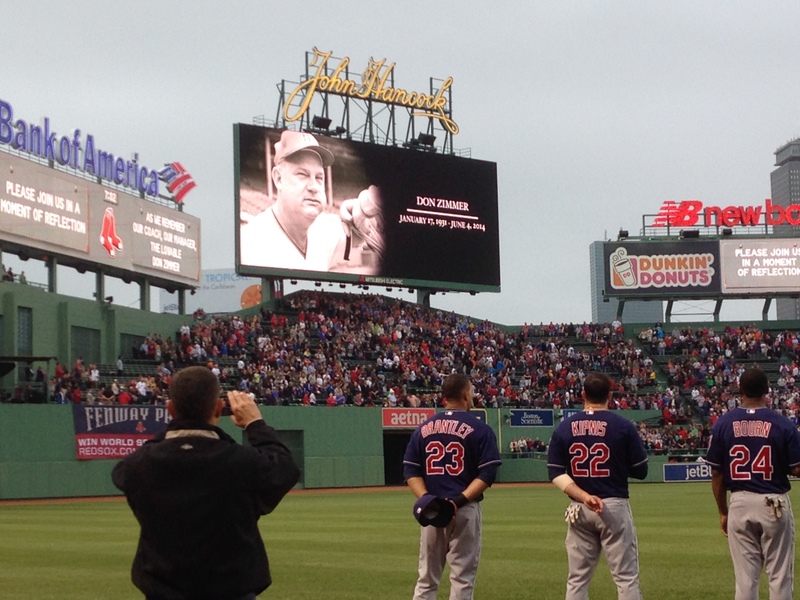 A 50 second moment of silence occurred leaving Fenway silent. The announcer then continued, “Ladies and Gentleman we are One Boston. Ladies and Gentleman we are Boston Strong. Ladies and Gentleman this is our city. Lets play ball.” It was a great moment to be apart of. 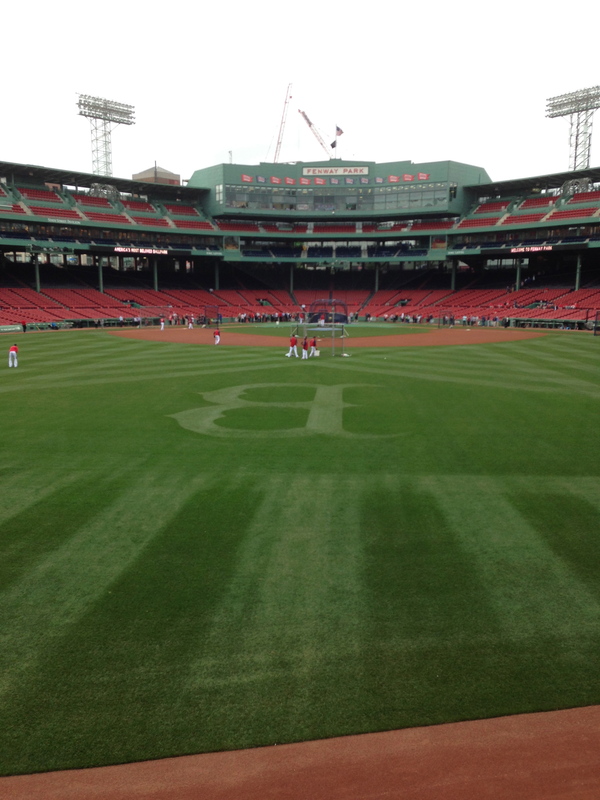 It was a great moment to see Fenway so quite for a change and it was amazing to witness. In the bottom of the 5th inning, the Sox finally got back in the game when Hanley Ramirez hit a home run over the Green Monster that also scored Pedroia. After the inning the score was 8-4 with the Nationals still in the lead. The Sox were not done offensively because in the bottom of the 6th inning, Brock Holt hit a ground rule double that scored Mike Napoli from second. Then in the top of the 7th inning the Nationals responded when Moore hit a two run shot that scored Ramos. The game would end with the same score with the Nationals beating the Red Sox 10-5 giving Gio Gonzalez the win and Wade Miley the loss. The best feeling in the world is leaving your class to go to the Sox game. I have been waiting for 2 weeks after Opening Day to go to my first game of the 2015 season. Since the last time I went in September, the roster has changed. Our pitching rotation was completely different with two Red Sox starters returning from last years team. We signed the lefty Wade Miley and we welcomed Justin Masterson back to Boston. The Sox had an outfield overload and decided to trade Yoenis Cespedes to the Tigers in exchange for Rick Porcello. The lineup looked different as well. We signed Pablo Sandoval to play third base and welcomed Hanley Ramirez back to Boston to play left field. The signings will hopefully allow our lineup to have more power offensively. This season is going to be fun to watch and hopefully is less stressful then last season. Going into Boston for a 6:10pm was slightly weird. I left my school around 1:00pm and stopped by my house for my bag packed with my game day essentials. I always bring pens, 4 baseballs, Red Sox hat, visiting hat, and a Red Sox jersey. I also brought a cheat sheet of the visiting team that has everyone on the team’s picture, position, and which way they threw. Also on this sheet, are my autograph targets of the day. Since the Sox where facing the Nationals, I had a great amount of targets circled. I wanted to make sure I left my house at 2:00pm. I got to Fenway around 2:30pm, and headed to my favorite line at Fenway. One person was there before me. His name was Mike Davison. Some people might recognize that name. Mike helped out with Zack Hample’s helicopter stunt. We talked about all types of different things and it was great to talk to him in line. He’s a great guy! 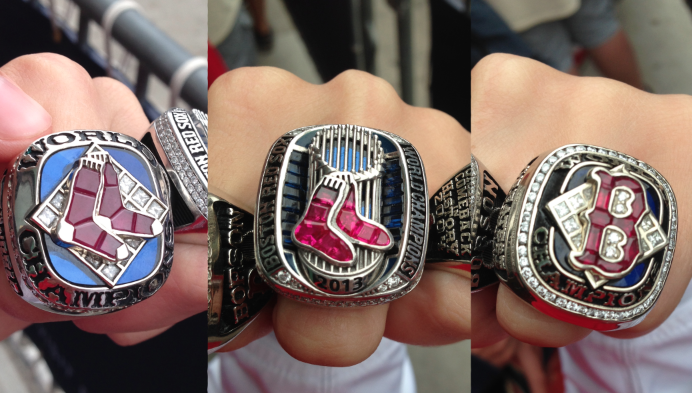 When Red Sox nation came around to stamp our hands, we didn’t have to show our Red Sox Nation cards. I guess I go enough now for them to recognize me. I was questioning if they were going to bring back the wristbands or keep it going with the stamps. They are using stamps again this year. I got a new stamp with two bats crossed. Waiting in line got interesting when the fast food workers on strike walked down Lansdowne Street. At first we didn’t know what was happening. They walked all the way down the street with signs that said “BU students stand with the fight for $15” I am not familiar with the strikes but it was entertaining to walk a bunch of people striking for the first time. One thing I did notice as I was looking into the ballpark was there are new security measures for this year. Instead of having a security guard with hand-held medal detectors, they have walk-through magnetometers. Personally, I like the walk-through magnetometers because you can keep on walking instead of waiting for someone to come around with the hand-held medal detectors. The one thing that stinks is you have to take your phone and cameras out of the pockets and put them in a bin. You walk through the walk-through magnetometers and then they give your phone and cameras back. Going into the ballpark is always the best feeling in the world. I walked up the outfield bleachers entrance and the first thing I noticed was the cameras were gone. 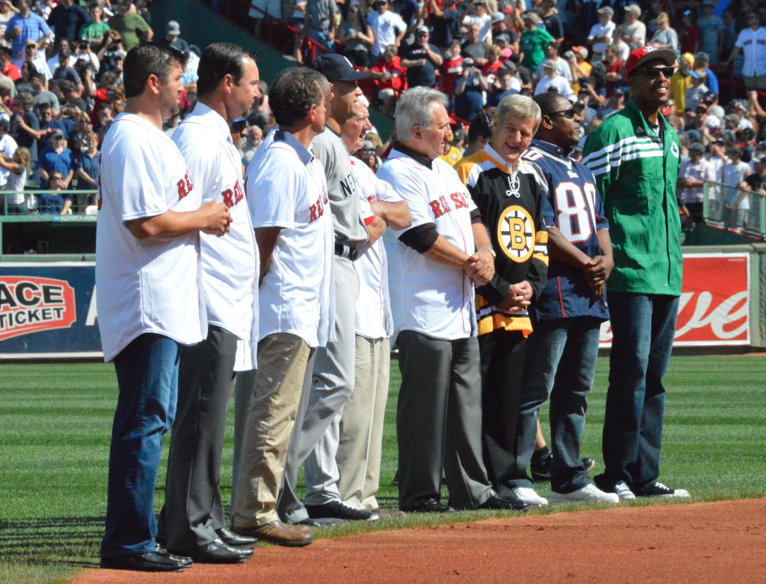 From the picture where Mike (in the Pedroia jersey) is standing you can see the different color in the walkway. My first reaction was there is a lot more room now. In the past years, batting practice homerun balls would easily bounce off the camera area and go back into the field. The cameras were moved upwards on a catwalk. Seats were also added to the area and it has a nice view that would be great to watch a game from. Taking away the cameras is going to give any one an advantage to catch a ball from that area now. These are just a few but are my main goals for the year. With the cameras gone, I moved closer to the Green Monster. With-in five minutes of being in the ballpark, my first ball of the year was caught. Wade Miley was shagging baseballs around left/centerfield. Because the cameras were not there I was able to move closer to him. He was near the American League scoreboard. Mike may have gotten his attention but he threw the ball to me. There it was number one of the year.The ball was a Robert D. Manfred Jr. ball. Robert D. Manfred is the new Commissioner of baseball. Commissioner Allan “Bud” H. Selig had retired after being commissioner since 1992. Since I have been alive Bud Selig has been the commissioner. 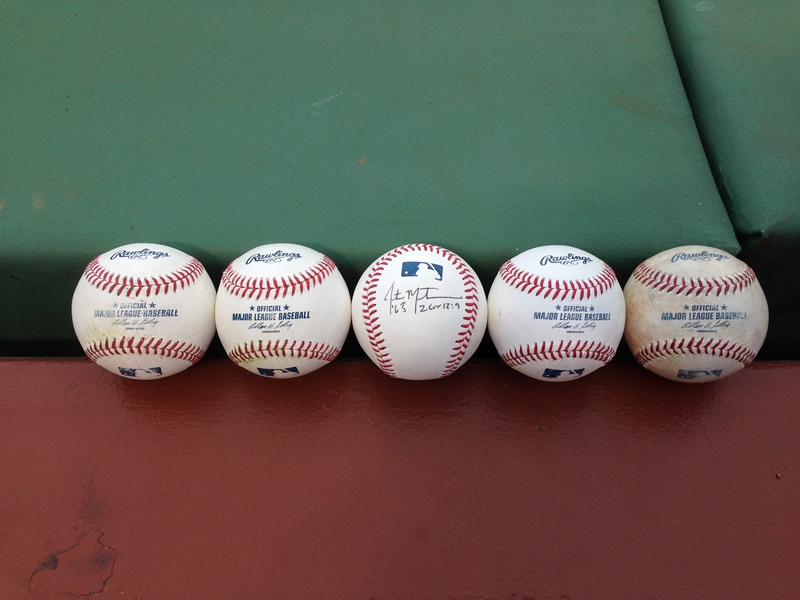 Each baseball has had a Bud Selig signature on each baseball under the Official Major League Baseball stamp. My thought process during the day was wondering if teams would still have Selig balls still around. After 20 minutes of hoping for a homerun ball to come my way, a ball was hit into centerfield. 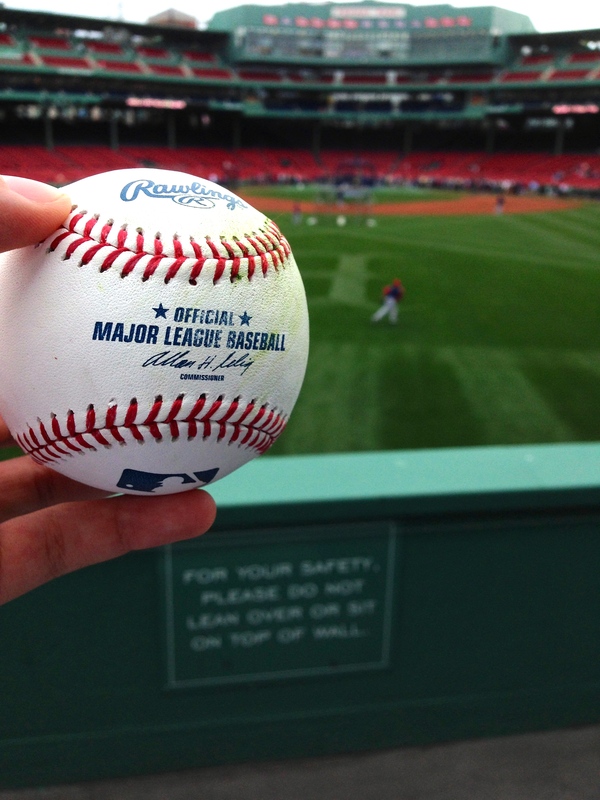 Junichi Tazawa caught the ball and then turned around and tossed me the ball for my second of the day. 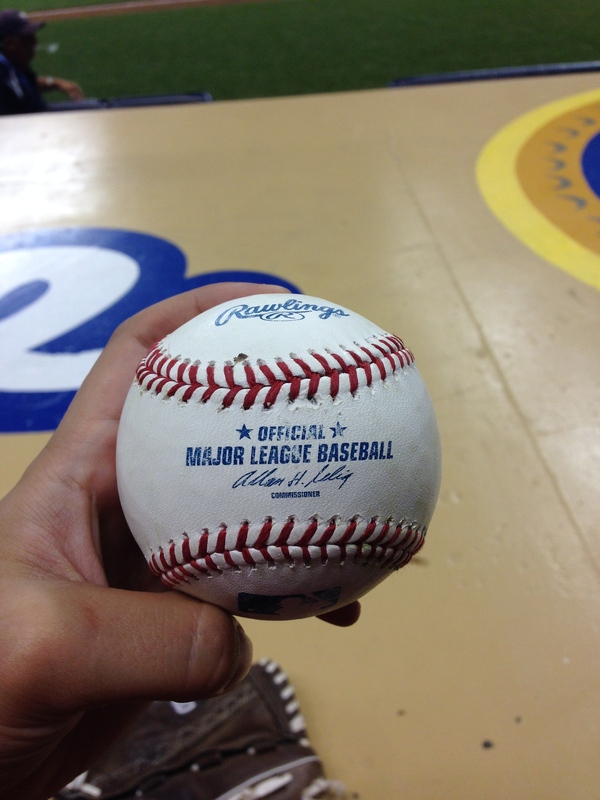 Just like the ball before, it was a Robert D. Manfred Jr. ball. This was also stamped with a red box with a check mark right on the sweet spot. 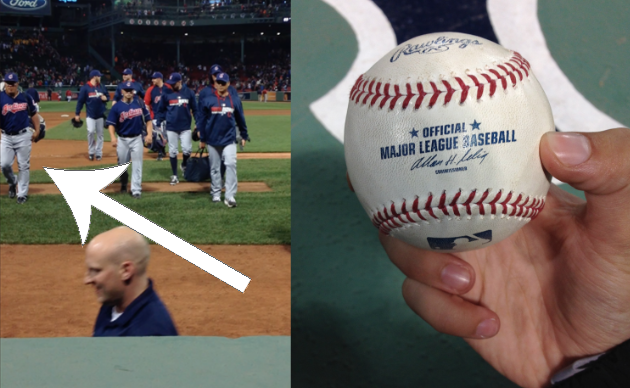 I wondered if this ball was from other team because the Red Sox normally do not mark their practice balls. The National’s pitchers were warming up but in the weirdest way. They had a Nerf football and were running routes. I was watching them for a while. Then out of the corner of my eye, I saw a ball coming our way. I ran over and it was above my head, I jumped but missed it. Thankfully, the ball bounced off a seat and right into my glove for my third of the day. I then went right over to a little girl and gave her the ball. Her and her mom were very thankful that I gave them the ball. The ball was another Robert D. Manfred Jr. ball. The little girl and her mom were thanking me for the rest of batting practice. 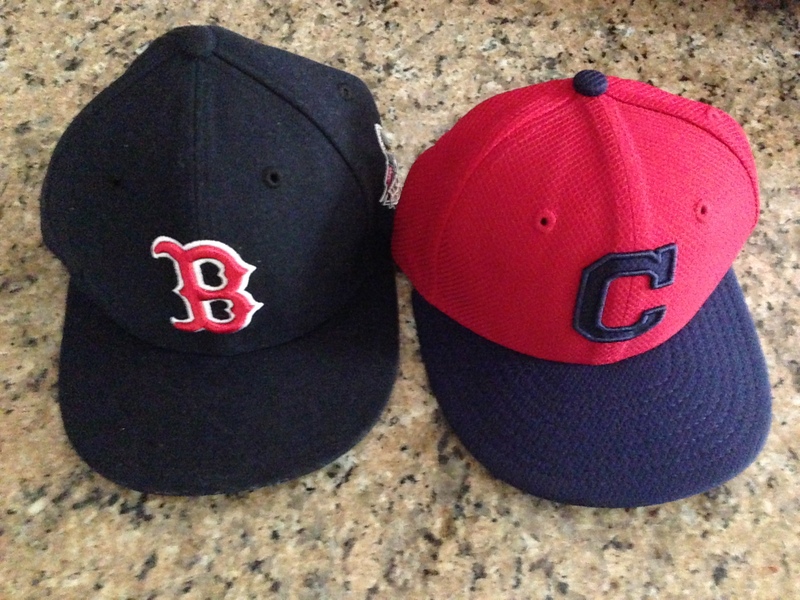 I had three baseballs through Red Sox batting practice and it was time to take off the Red Sox hat and put on a National’s hat on. I had to take the GoPro off and have it in my hand, which brought some weird angles. I was moving back and forth throughout the outfield sections. Homeruns were coming more often but were scattering all around. As I was moving around a ball was tossed up and missed. It landed if front of me and I picked it up. This ball was an Allan H. Selig baseball. The nationals must have been using a lot of old baseballs. I gave the ball to a little girl whose birthday was today. Happy Birthday to her! I then kept an eye out for more home runs. A National’s player hit a shot into the area would the cameras would be. It landed in the seats and I beat out Mike for the ball. Sorry Mike! Mike and I were going back and forth with balls all practice and it was nice to have some competition. I believe he ended up with 7 during batting practice. The batting practice homerun would be my 5th of the day and also at 249 lifetime. I was one away from 250! I didn’t realize this for a while. It randomly occurred to me when I was thinking of the fact that I had 5 on the day. I honestly didn’t think about 250 going into the game. Michael Taylor was in centerfield shagging baseballs. He caught one baseball and then ran for another one. He looked at me and threw one of the baseballs. BALL 250 lifetime and also my 6th of the day! I could knock off another milestone of 250. Next one is 300! Since Taylor had two baseballs in his hand, Mike tried to get the other one. Taylor threw it to him but the throw was low. A little later I positioned myself right at the end of the wall next to the monster. Fans were heckling Max Scherzer, Gio Gonzalez, and some other National’s players. They were funny but also may have crossed some lines. They were saying how Gio was on their fantasy team and this was also how they were trying to get a ball from him. They then started saying that their friend traded him away. When Max threw a ball back in to the bucket area, they were yelling “Hey! Wrong way.” They then started asking at Gio if he had a car seat or if he could get into the rides at the carnival. They finally got the attention of the players. Gio and Scherzer then started laughing at them. Then they told Scherzer to grow a Mohawk (like the kid had) and then Scherzer came back and say “Why? I don’t want to look like you.” They also went as far as asking Scherzer which eye he was looking at them with, the blue or the brown one. It went over the line but at least the players were laughing about it. Scherzer ended up tossing me a ball in-between the other fans heckling for my 7th of the day, which was also an Allan H. Selig ball. The nationals must have had only Bud Selig balls because that is the only baseballs I got from them. They where probably trying to get rid of them all. After the Scherzer ball I decided to leave the outfield and head towards the dugout. As I was heading toward the dugout I went passed the Good Sport table. 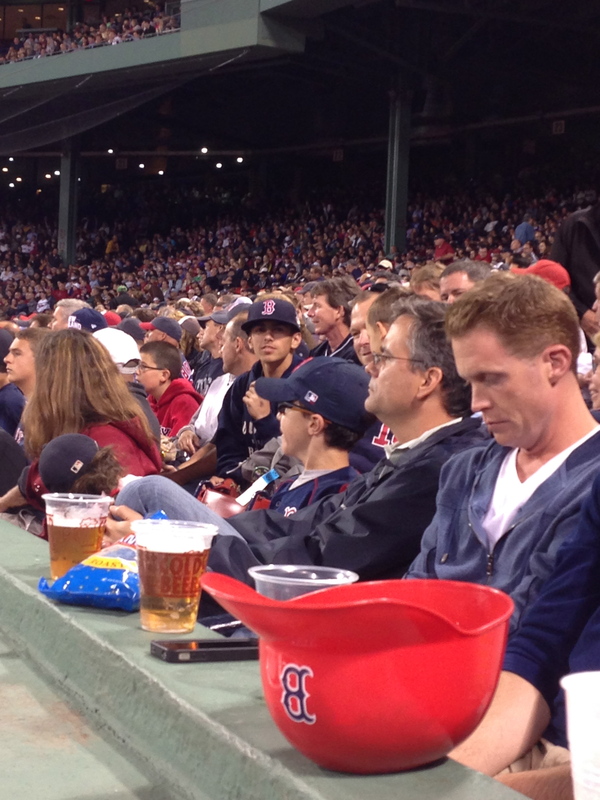 At the table you pledge not to drink and be responsible at the ballpark. When you sign up you get a free soda and enter to win a Red Sox pullover. After, I headed to the dugout. When I got there, batting practice was just ending. Tanner Roark was signing autographs. He went down the whole dugout and signed for everyone. 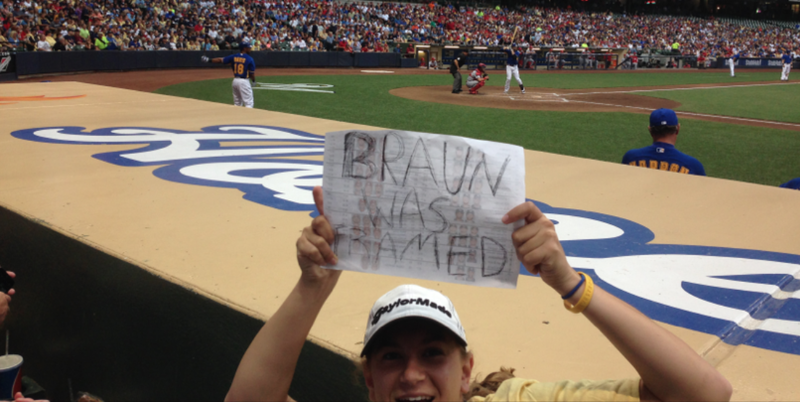 I got his autograph and moved to my autograph spot in between where the ball girl stands and the security guard are. When players started coming out a few of them came over and signed. Ian Desmond came over and signed autographs. I already had him so I was hoping others would come over as well. National’s outfielder Clint Robinson came around and signed as well. He signed one of the baseballs I had. Also, Bryce Harper came over and was signing autographs. I was very close to getting his autograph as he skipped over me. I then saw Scherzer signing autographs as well. I walked over to him with the ball he gave me and asked if he could sign it for me. He did and signed it right on the sweet spot. After he autographed the ball, it was time for the National Anthem. The starters of the Game were Stephen Strasburg for Washington and Justin Masterson for Boston. In the top of the second inning, Michael Taylor singled off of Masterson, which allowed Danny Espinosa to score. In the bottom of the inning, the Sox responded when Mookie Betts doubled off Strasburg allowing Mike Napoli and Brock Holt to score. In the bottom of the 3rd, the Sox responded by scoring twice making the score 4-1. In the bottom of the 4th, Pedroia hit a homerun into the Monstahhh. In the top of the 5th the Nationals responded by scoring 6 runs with 4 hits in the inning. After 5 innings, the score was 7-5 with the Nationals in the lead. In between the top and the bottom of 6th inning, first base coach, Tony Tarasco, collected the warm up ball that was thrown in from Ryan Zimmerman. He then tossed me the ball for my 8th of the day. In the bottom of the 7th inning, 3 errors helped out the Sox as they scored 3 in the inning without any hits. After the inning was over, the score was 8-7 with the Red Sox in the lead. In the bottom of the 9th, the first replay of the year at Fenway happened. Ryan Zimmerman hit a long foul ball near the left field foul pole. National’s manager went out and wanted the umpires in New York to look at the hit again. The play was confirmed as a foul ball and Zimmerman ended up lining out to left during his at-bat. The game ended with the Sox winning after Uehara came in for the save. After the game, when the pitchers and coaches from the bullpens came back to the dugout. 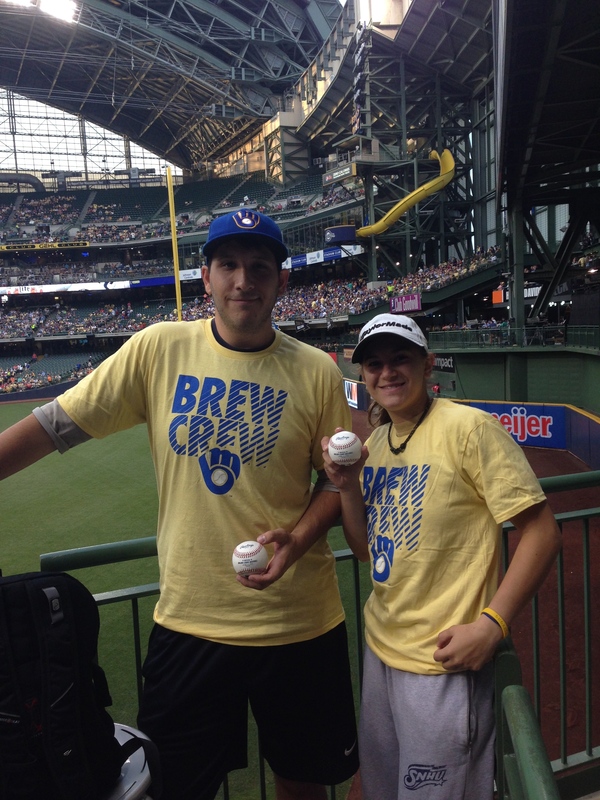 The Bullpen coach, Matthew LeCroy came around and tossed a couple baseballs to fans. He threw one right to me for my 9th of the day tying my personal best. The two challenges for the picture were. Thank you Shawn for taking the picture! 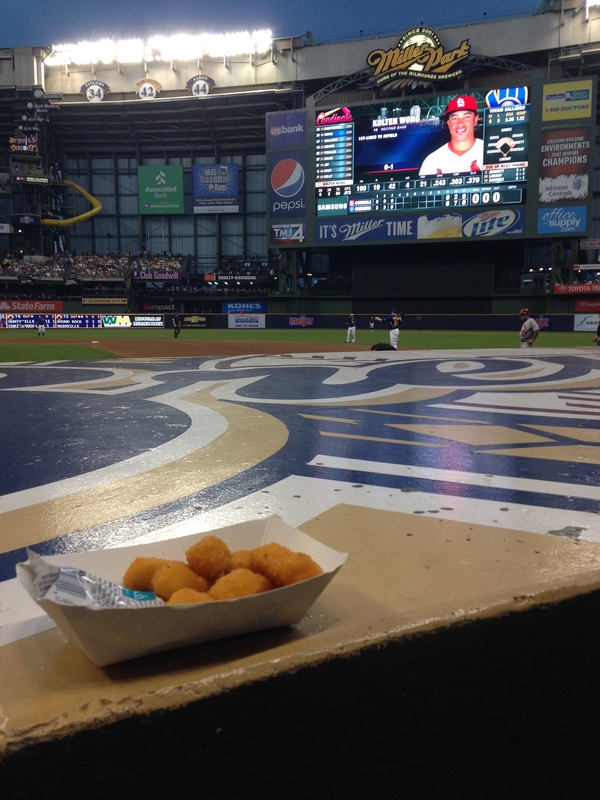 While I was in Wisconsin, everywhere I went I got cheese curds. I was rating them on how they were everywhere I went. The cheese curds were great but for the price and how much they gave you it wasn’t worth it. They ended up overall in the bottom 3 of the cheese curds I had. The thing I did like about them is the ranch they gave you. Cheese curds and ranch is a great combo and I recommend trying them. I then went to my actual seats for the first time in a while. My aunts were sitting with the Commissioners Public Relations guy. 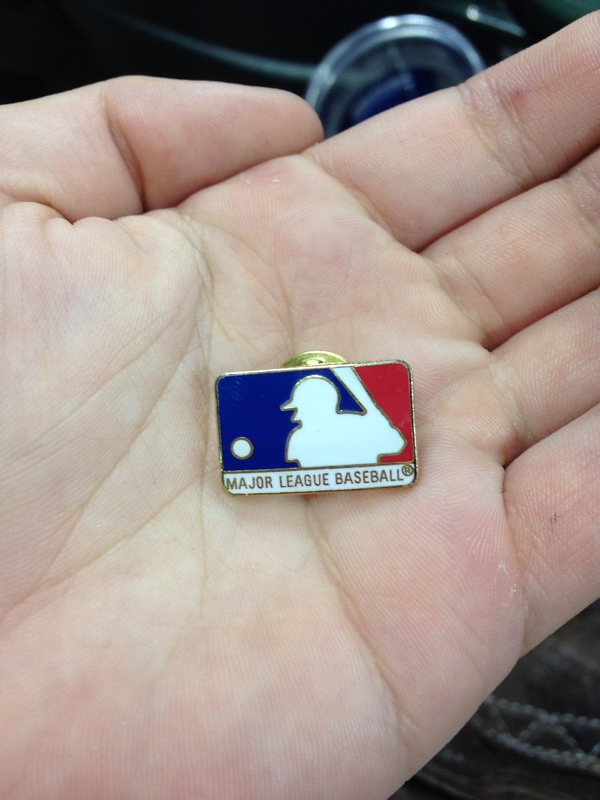 He gave me a Major League Baseball pin. I put the pin in my backpack and it will stay there hopefully for good luck. In the top of the 8th inning, Peter Bourjos grounded out to the pitcher, Brandon Kintzler. Kintzler then threw the ball to the first baseman, Mark Reynolds. He threw me the ball, for my second of the day. Jeter’s career was going into the final stretch. 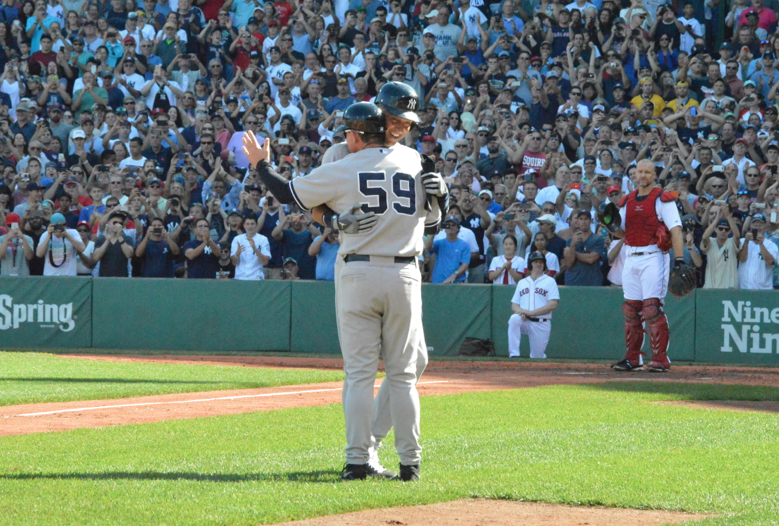 Jeter had just come off his last game at Yankee Stadium, which was an emotional night for all. He delivered when he ended his final home game with a walk-off single. Only Jeter would hit a walk off in his last at-bat in the pinstriped uniforms. After quite a night, he announced that he will not play shortstop during his last series at Fenway and his career but he would be the designated hitter for the Yankees. I was going alone to the game, again. Going alone has been come a norm for this year. I don’t mind it, less to worry about. 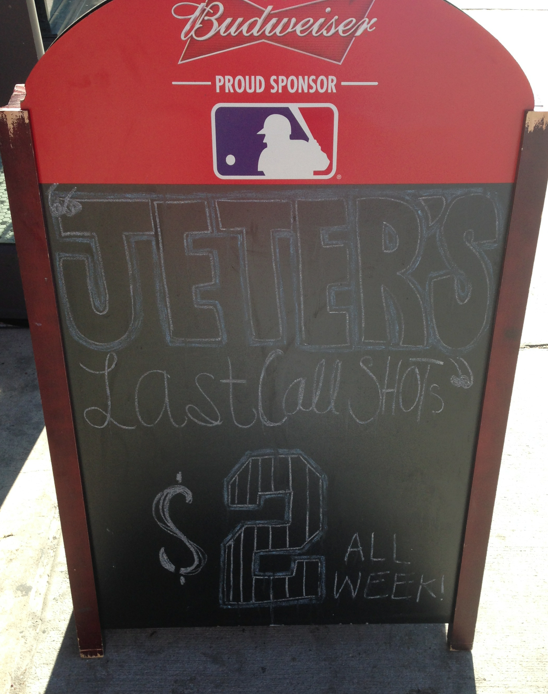 As I was walking around Fenway before I got to Gate C, I saw “JETER’S Last Call Shots” $2 ALL WEEK!!!. Not sure if that is a good discount or not but thought the idea was great. I got to the gate and I was first in line. 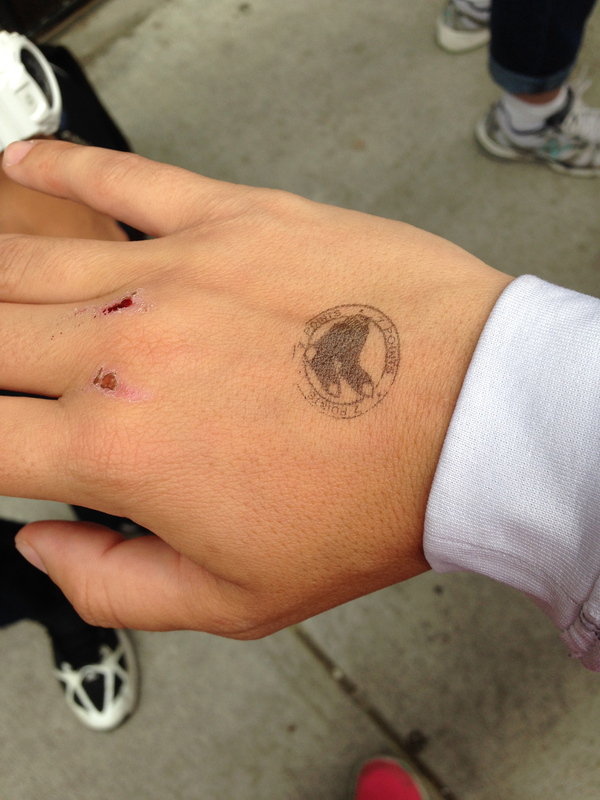 Red Sox Nation workers came around and stamped our hands. I got a new stamp that I haven’t seen yet. When we went in to the gate, I went up into my spot. The new outfielder Rusney Castillo was taking fly balls. After he got his last one, he threw the baseball to me for the first one of the day. Later on in the batting practice, when most of the players were off the field, Coach Arnie Beyeler tossed up another baseball to me for my second on the day. The Red Sox were still batting and a Red Sox player, who I couldn’t tell who they were, hit a shot over my head. I quickly got to it in the stands 5 rows up from where I was. No one was around me so it was a quick easy snag for my third ball of the day. I then headed over to the Red Sox dugout because the yankees were not doing batting practice. 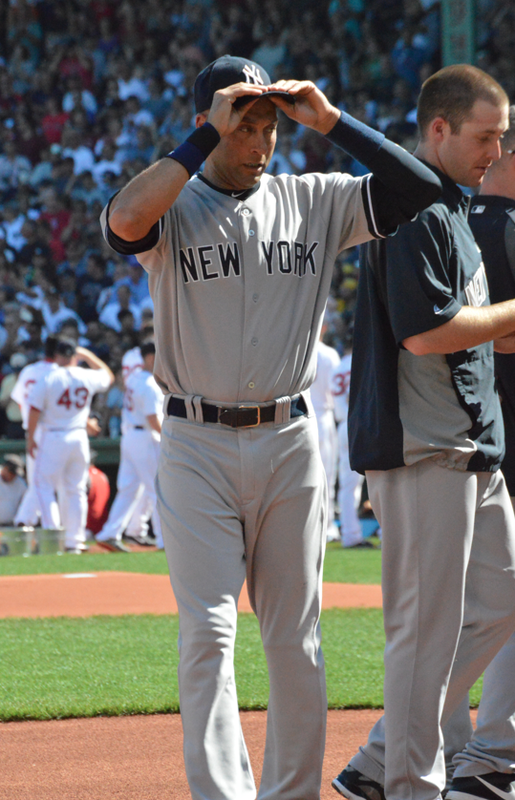 Words were going around that Derek Jeter was not going to be playing today. Of course, I was slightly disappointed but I don’t blame him, he had a long emotional night the day before. At the dugout Brock Holt was signing autographs, unfortunately I didn’t get one. I then headed over to my normal autograph spot. First sign of Jeter happened not to long after. Closer to game time Brett Gardner was in the dugout. He then signed a baseball I gave him. Not much later it was time for the National Anthem. Steven Wright would be pitching for the Red Sox and ex-Red Sox pitcher, Chris Capuano would be pitching for the Yankees. In the first inning, Yoenis Cespedes tried stretching a single into a double. He was called safe but the Yankees wanted to use instant replay to get the call right. After review, the call was overturned and he was out to end the inning. In the bottom of the 2nd inning, the Red Sox struck first. 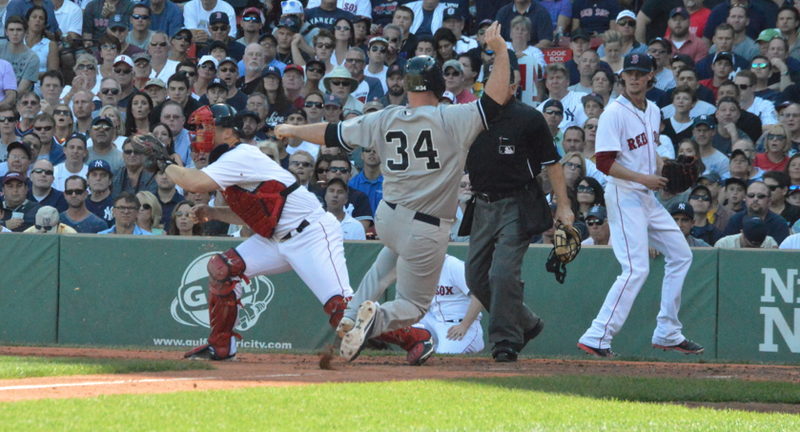 Allen Craig singled and went to second on a throwing error. On a Byrce Brentz single, Craig scored giving the Red Sox a 1-0 lead. In the top of the third the Yankees responded. Eury Perez struck out but reached first and then to second on both passed balls by Dan Butler. Fransico Cervelli then knocked Perez in with a single to left, tying the game at 1 a piece. Later on in the inning, John Ryan Murphy grounded into fielder’s choice to shortstop and Cervelli scored on throwing error by second baseman, Mookie Betts who was trying to get the double play. The score on the error gave the Yankees a 2-1 lead. 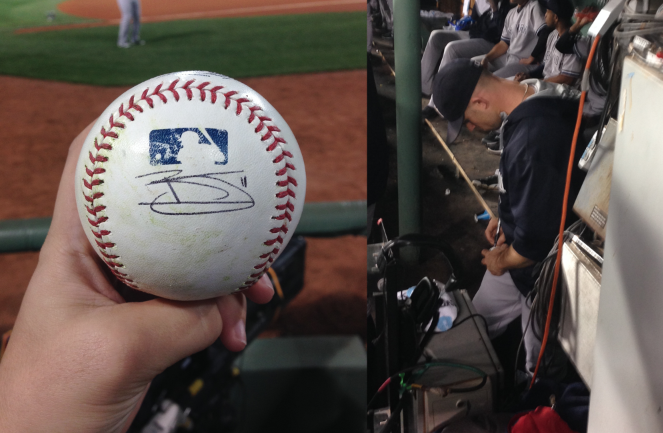 Before the 4th inning, one lucky fan got an autograph from Jeter. Jeter went into the dugout and grabbed a ball and signed it. He then tossed it up to a fan. In the top of the 6th inning, Zelous Wheeler hit sacrifice fly to right that scored Murphy giving the Yankees a 3-1 lead. In the bottom of the 7th, Shawn Kelley relieved Capuano and then next batter Rusney Castillo hit home run over the monster to allow the score to be 3-2 in the Yankees favor. The Red Sox had a chance to tie the game in the bottom of the night but finished the game with a runner in scoring position. Yankees won the game 3-2 in a night we saw Jeter sit on the bench. Red Sox pitchers were warming up but also, there was nets set up. The Red Sox didn’t look like they were going to hit but the Yankees were going to. I decided since I had my camera, I wouldn’t stay in the outfield for batting practice but get up close photos of Jeter in and around the cage. 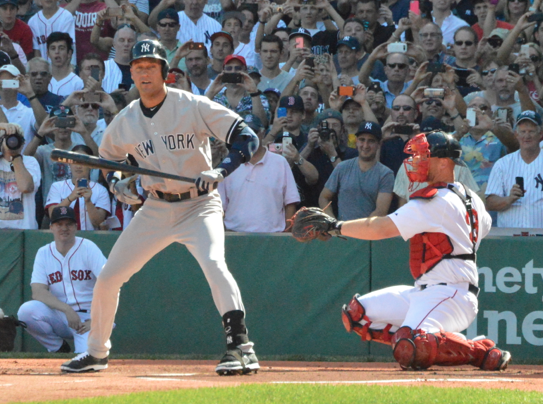 I went to the backstop and took a lot of pictures from there: Jeter’s Last Game Photos Here. I got some gre at photos. It was worth going there instead of watching batting practice from the outfield. I had set up half way mark between the dugout and the cage. I snuck my way to the first row, right on the black ropes. 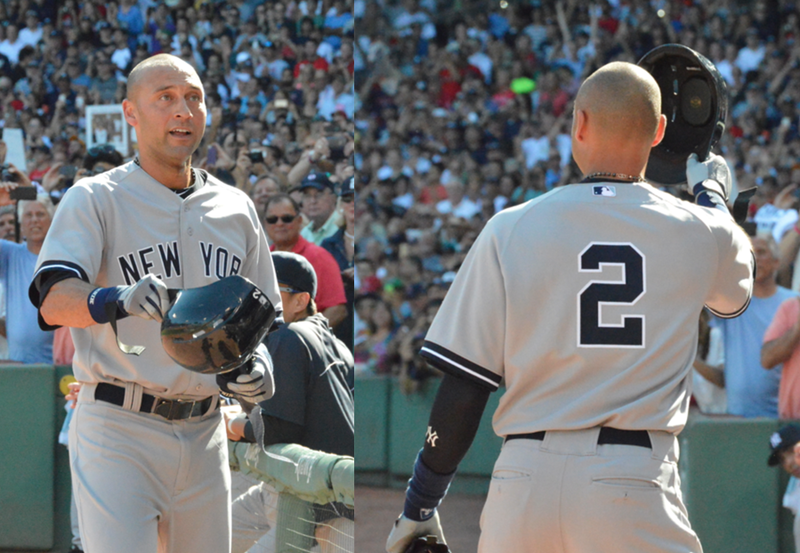 All eyes were on Jeter and he was all smiles. He would occasionally look over at all of the people. Spike Lee was decked out in his Jeter attire. Past Red Sox, Jacoby Ellsbury and Steven Drew made appearances. There was a good amount of signs all in favor of Jeter. I was expecting the amount of signs but some were a lot more clever than I thought they would be. Through out the day I saw a lot of cool things fans did for Jeter. There was socks with the #2 and there was kid with Jater’s number shaved into his head. When the Yankees slowly started to leave the field, I quickly moved to the dugout and got close enough that I would get a couple good shots of Ellsbury coming off the field. I then headed to left field where Ichiro was warming up with a trainer. I watched him doing running drills until Tanka came out and started throwing. I turned my attention to him. The grounds crew started to get the field ready shortly after Tanka was done throwing. When the grounds crew were finishing up Red Sox players started coming out and warming up. Then some Yankees players started to come out. Michael Pineda, the starting pitcher for the Yankees, started heading to the bullpen to warm up. 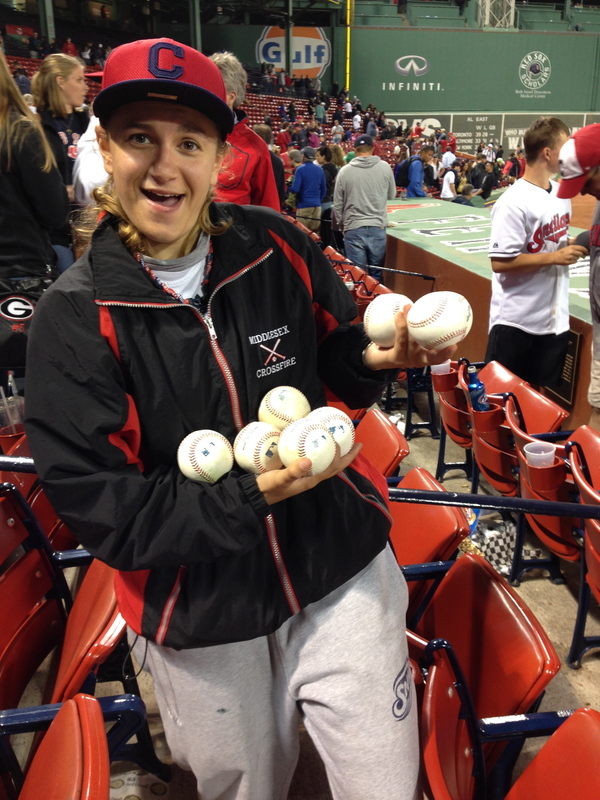 Meanwhile the ball girls were putting buckets of baseballs near the bases and in the outfield. In the inning, Pirela doubled to center which caused Cervelli and Young to score. Murphy then singled to center and Pirela scored. Romine doubled to center, and Perez scored. 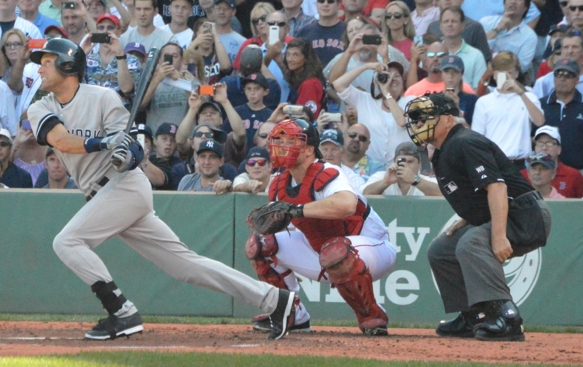 Headley singled to right, scoring Murphy to take a 9-0 lead. During the middle of the 7th inning, Take Me Out To The Ballgame was special. 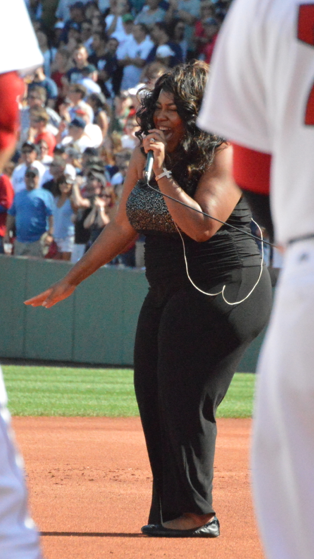 The Red Sox brought in former New York Yankees outfielder to sing Take Me Out To The Ballgame. Bernie Williams came to Fenway and played his guitar while singing. He put his on twist to Take Me Out To The Ballgame. Only during this game, would a former Yankees player sing and play guitar for the seventh inning tradition. In the bottom of the 7th inning Rogers relieved Pineda. Butler doubled to right which scored Craig and Cecchini. Castillo then scored on error by right fielder Perez. Mookie Betts doubled to center, which scored Butler and Weeks bringing the score to 9-5. The game ended with the same score. During the 8th inning I went over to the dugout for my normal “9th inning seats.” I waited until the game was over and tried to sneak in to get a Jeter autograph but had no luck. I stuck around a little bit and a saw a trainer walking around. I asked him if I could get a baseball please. He went back into the dugout and grab a ball and tossed it to me. I didn’t go out empty handed and the ball streak continued! Good Luck to Derek Jet in his retirement! Also, in centerfield was Justin Masterson. He was talking to one of the vendors in the “triangle” and then signed for a couple fans. 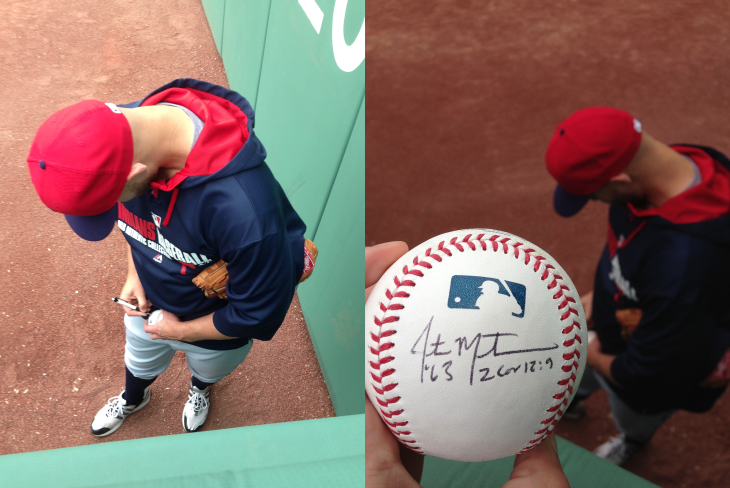 Since Masterson was on the Red Sox at one point, he was on my autograph hit list. I could now cross him off my list: I then moved back into centerfield. My brother then got a ball from a little kid with “Cabrera” on the back of his jersey. 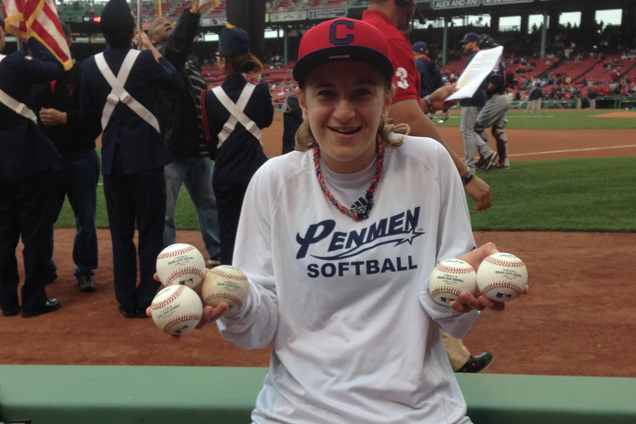 He now had 3 baseballs and I had 2, taking the lead, again: Wasn’t much longer before we were tied again, when Josh Outman tossed me a ball: After the gates opened, I headed over to the dugout to get ready for the players to come off. Two different coaches gave me a ball: It was worth going over there for 2 baseballs. There were not a lot of people around. There were a lot of older men looking for autographs, so it was easier to get a 2, since I didn’t try for the second one. 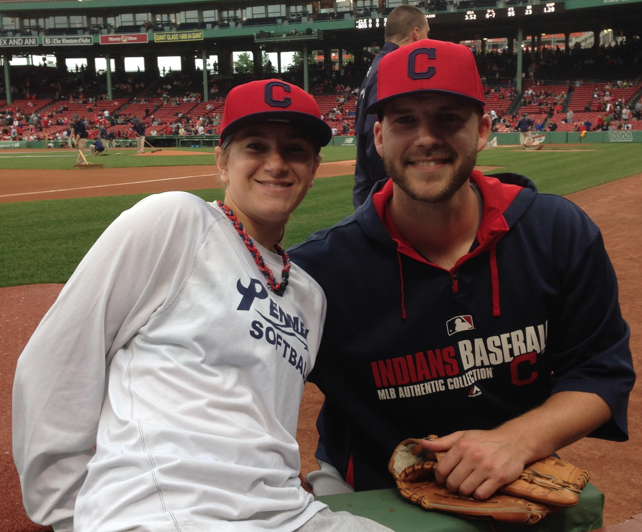 I then met up with my brother on the third base side, pass the media, where Justin Masterson was signing and taking pictures with fans. Here is my brother getting the autograph and his picture with Masterson: And here is mine: Here is me with the 5 baseballs I had gotten so far: I also tried to get artsy and take a picture of just them: Here is my brother with his 3: The game started off with a moment of silence for Don Zimmer who had passed away: After the National Anthem, Jason Kipnis and Mike Aviles were playing catch. As soon as they were done, Mike Aviles tossed me a ball for my 6th of the day: During the game, Jon Lester was pitching for Boston: In the bottom of the 2nd, Grady Sizemore hit a ground rule double that scored Mike Napoli: In the bottom of the 5th, David Ortiz hit a 2-run home run to center field, making the score 3-0. In the top of the 6th, the Indians responded when Jason Kipnis singled to right allowing Bourn and Brantley to score. The Red Sox were still in the lead 3-2. Me and my brother were in different place during most of the game. Can you find him? In the bottom of the 6th, someone I was talking to for most of the game recognized me from 4 years back. She goes to one game a year and we happened to go to the same game again. She remembered me because she never sees any other girls with the opposite jersey or hat. She then also said she remembered me because 4 years ago she bought me a hot dog. I instantly remembered her. Not to often does another fan buy you a hot dog at a game. Well, we may have started a tradition because she bought me another hot dog: In the same inning, the Red Sox responded with two more runs from a Brock Holt double when Jonathan Herrera and Jackie Bradley Jr. scored. 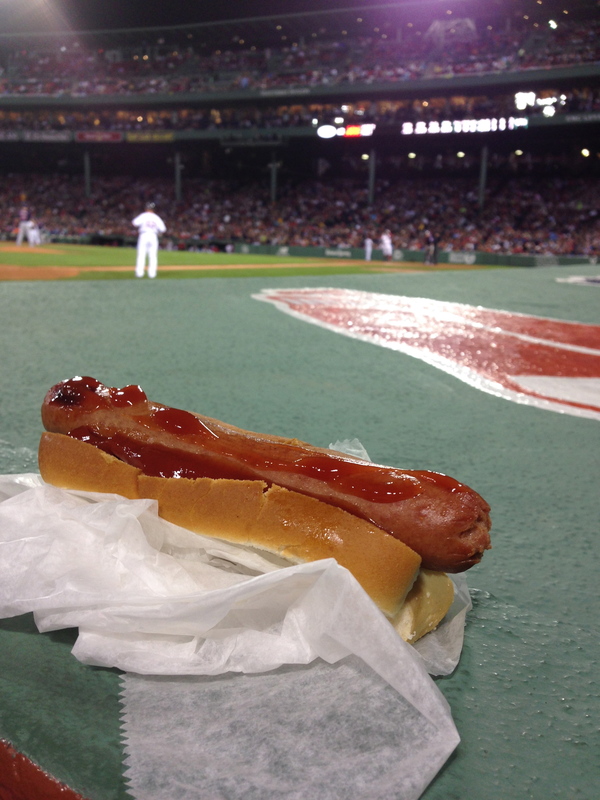 Maybe the hotdog gave us some luck giving the Sox, a 5-2 lead. After the 8th inning I found my brother and we moved sections. We headed over to the umpire tunnel area and watched the rest of the game from there. In the bottom of the 9th, Koji Uehara came on for the save: He pitched a 1-2-3 inning to help the Red Sox win 5-2. Autographs season: Grant Balfour (Rays), David DeJesus on batting gloves (Rays),R.A Dickey (Blue Jays), Edwin Encarnacion (Blue Jays), Todd Frazier (Reds), Brandon Gomes (Rays), Billy Hamilton (Reds), Brett Lawrie (Blue Jays), Jon Lester (Red Sox), Justin Masterson (Indians), Wil Myers (Rays), Jake Peavy (Red Sox), Brandon Phillips (Reds), Neftali Soto (Reds), Brandon Workman (Red Sox).